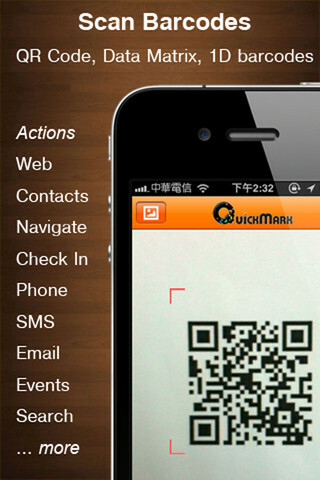 QuickMark is barcode reader and generator for your iOS device. Simply place the barcode in your camera viewfinder and it will automatically grab the information from the barcode. From reading a barcode, QuickMark will be able to access web links, make phone calls, send emails, add contacts, navigate maps, check in to a location, add calendar events, and even conduct a search online. 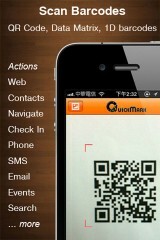 And once you scan any barcode, the information therein will be synced across all your devices by way of iCloud. QuickMark also provides the ability to share any of the scanned information to social media networks such as Facebook, Twitter, Evernote, Read It Later, and Instapaper. It is also worth noting that there is a Google Chrome extension for QuickMarks. You can actually grab all of your scanning history and then view websites online instead of on your phone. I could see many Chrome users taking advantage of this feature. Some users might also be interested in the fact that QuickMark supports many 1D barcodes that often are found on packages, goods, bills, and books. But you might need to use an external macro lens in order for it to work. Some people might interested in this, depending on their field of interest.